Despite the unique characteristics of the Red Sea (high temperature, high salinity, and oligotrophic conditions), only a few benthic studies have been conducted in its deep-sea environments. Hence, a study on macrobenthos was undertaken in deep-sea locations of the Red Sea within the Saudi Arabian waters. Sediment samples were collected using a box corer from 63 stations located between about 23°N and 28°N, during a cruise on R. V. Aegaeo in November 2012. The depth of the stations ranged from 96 to 1,678 m, with 85% of the stations having a depth ≥500 m. Hydrographical parameters were measured, and sediment characteristics were determined. A total of 199 taxa, including 147 polychaetes, 27 crustaceans, 19 molluscs and 6 other taxa were recorded. Density (10–2,712 ind. m−2), biomass (0.02–10.98 gm−2), species richness (1–59 taxa), and Shannon-Wiener diversity, H′ (0–5.1) were estimated. Biotic variables decreased with depth, while latitudinal variations were absent. 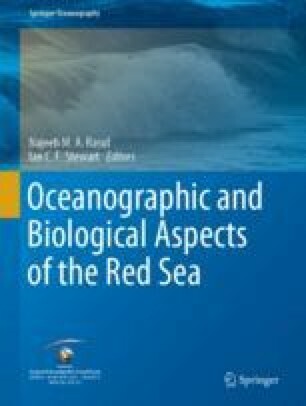 The spatial patterns in macrobenthic variables closely match those of the organic matter, indicating the importance of food availability for the sustenance of the macrobenthic communities in the deep-sea environments of the Red Sea. Other parameters such as temperature, salinity, and dissolved oxygen were also found to influence the macrobenthos. The authors thank the crew of the Research Vessel RV Aegaeo for their professionalism and support during the cruises. We are grateful to the Environmental Protection Department, Saudi Aramco, Dhahran, Saudi Arabia, for guidance and encouragement. We are also grateful to the Center for Environment and Water, Research Institute, King Fahd University of Petroleum and Minerals, Dhahran, Saudi Arabia, for providing research facilities. We thank Dr. S. Ajmal Khan (CAS, Annamalai University, India) and his team for the help in identifying benthos specimens. We are also thankful to Dr. Chandana Senaratne, KFUPM/RI, for editing the manuscript. We highly appreciate the editors and all the reviewers for their suggestions to improve the quality of the manuscript.